Ham’s Auto Parts provides quality auto parts to commercial and retail customers around middle Georgia. Our experienced team is ready to assist you in finding the right part the first time for your vehicle. Scroll down to read our story and meet our team. They’re waiting to help you out! If you are looking for a part and would like our expert advice, don’t hesitate to call or come in to one of our 7 locations. William J Ham Jr opened the first store on Main Street in Barnesville in June of 1963 becoming the first NAPA Jobber in the Ham family. He was working in a Pembroke Chevrolet dealership when he decided he was ready to go into business on his own. ‘Pops’ always had a knack for automobiles, and he had a good friend and mentor who was a NAPA jobber, so it was only fitting. 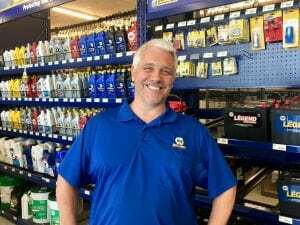 He moved to Barnesville to be closer to family, and so began the Ham family auto parts business. The group of stores are now owned and operated by William J Ham III. William spent his childhood learning and working with his dad, refurbishing a string of cars and motorcycles. He studied at Georgia Tech and received his degree in Industrial Engineering. After a short stint working as a civilian engineer on Robins Air Force Base, he couldn’t stay away from the family business. He came to work for his dad full time in 1988 and took over operations of the group of stores after the elder William Ham retired in 2004. Shown here are Bill (Jr.) and wife Freida Ham, William (III), son Joel, and daughter Madison at the opening of the new location in Barnesville. Finding the parts you need everyday – What would we do without them? Steve is the manager of our store in Barnesville. He started with Napa in February of 1987 and has been with us ever since! Steve is an ASE Certified parts specialist. When he’s not at NAPA, he loves going to the beach or mountains or on family outings with his wife Jeanie, son Tyler, and daughter Hannah. Charles is the manager of our store in Forsyth, where he has been working since 2000. He is an ASE certified parts specialist. When he has free time, he enjoys gardening and working out – you can frequently find him at the gym! Michael is the manager of our Jackson store. He has spent his whole life around the NAPA family (with stores in south Georgia) and came to work for Ham’s NAPA when he moved north. We are thankful for his expertise and are sure you will be too. BJ is our manager in Roberta. He has been with Ham’s NAPA since 2012, and lived in Culloden all his life. 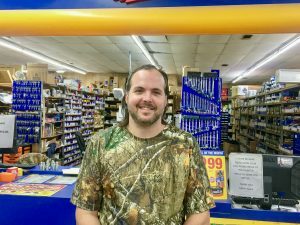 BJ is a Georgia boy through and through, who enjoys hunting and fishing and will go the extra mile for his customers and friends. He loves his wife Christina and son and daughter dearly. Terrell is the manager of our store in Thomaston. 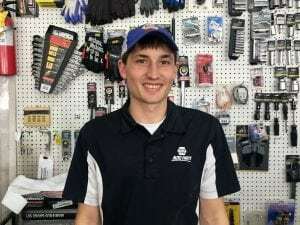 He is an ASE parts specialist and one of the friendliest faces around. Come in and meet him – even if you’re just coming to say hey or get a bit of advice. When he’s not at NAPA he stays very busy keeping up with his five sons and teaching them everything he knows! John is the operations manager for Ham’s NAPA. His office is in Barnesville, so if you want to reach him, call our Barnesville store. John started working for NAPA in Florida in 1974, and came to Ham’s NAPA in Barnesville when he moved to middle Georgia in 1981. He is an ASE Certified Parts Specialist, with a knack for part numbers. Give him a number and he’ll likely know what part it is! He enjoys spending time with his wife, daughter, step-son, and three rescue terriers. Alicia is our accounting manager. She works out of the corporate office in Forsyth and handles accounts receivable, accounts payable, human resources, and payroll. You must believe she stays busy! She has 30 years of experience in the accounting field, including working for Ham’s NAPA since 2009. She loves being with her three sons, her daughter-in-law, and her first grandson! Some of her hobbies include being outdoors, riding horses, and drawing.